Sichuan is 2nd largest of the Chinese provinces. Only surpass by Qinghai because Xinjiang and Tibet are consider Autonomous Regions. Although in terms of rich farming area, Sichuan most probably tops the list. Which is why Sichuan has been called the land of abundance throughout Chinese history for it's ample agricultural resources. There are a large variety of fruits and vegetables that can thrive in Sichuan's rich and mild climate like citrus, chili peppers, pears, apples, grapes, pumpkins, peaches, mangoes, and many more. Walden Farm is constantly experimenting to which what fruits and vegetables to add to our collection of farm vegetables. Our farmers allocated a large percentage of the land for the purpose of planting Kyoho Grapes. 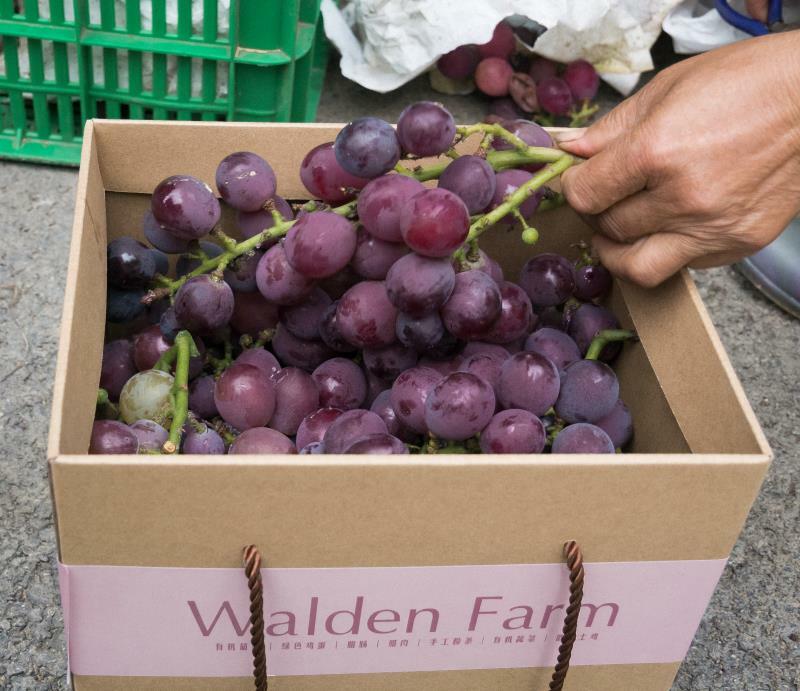 Grapes is one of our most produced fruits here on Walden Farm and a very important part of our business. If we take we care of them, the vines are provide fruits for some 30 years. Every year we will sell many boxes of fresh grapes to markets and consumers in nearby Mianyang, Jiangyou, and Chengdu cities. We use the best grapes for our grape boxes, and the second graded grapes for our wine production. The rest that do not meet our standards will be used to feed our animals. A tasty treat indeed. Grapes are a very low caloric food rich in manganese, vitamin B6, thiamin, and vitamin C. Grapes contains antioxidant that reduce the risk or hear disease. This is also why wine is consider a very healthy drink in moderation! Peanuts have a long history in ancient China. Originally discovered and grown in Peru, peanuts were first introduced by Portuguese traders in the 17th century in China. Ever since then, peanuts have become a common theme in Sichuan Chinese dishes and sauces such as Kung Pao Chicken. The climate and land in North Sichuan is very well suited for growing peanuts and our farmers harvest a between 3000 to 4000 kilograms per season in the autumn for personal consumption and oil production. China is the largest exporter of pumpkins in the world. We grow pumpkins in smaller quantities, about 1000 kilograms per year for personal consumption and for animal feeds. Pumpkins are very nutritious and provide much needed fiber, magnesium, and vitamins C and E.